Opened in 1992 by a Seattle transplant, Aurora Coffee has stayed independent through all the years—and has not deviated from its basic mission to serve as a serious coffee/espresso destination. Photos from a recent visit to Aurora Coffee are profiled below. 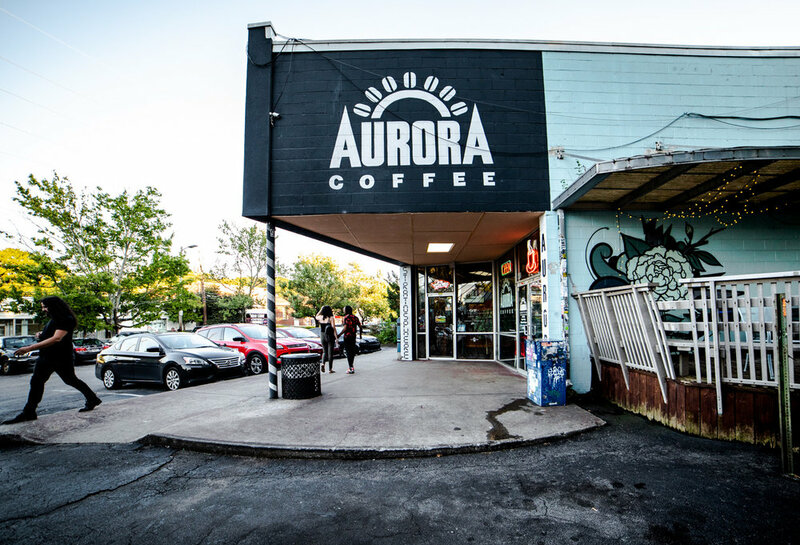 Aurora Coffee is located at 468 Moreland Avenue, next to the famous (or infamous) Junkman’s Daughter (an alternative department/clothing store). Exterior of Aurora Coffee in the Little Five Points neighborhood of Atlanta, GA. Junkman’s Daughter, visible also, is the neighboring store (you can read its brief profile here). Exterior side of Aurora Coffee in the Little Five Points neighborhood of Atlanta, GA.
A large wooden patio is one of the features of Aurora Coffee. The artwork is by a local Atlanta artist, Peter Ferrari. When you enter Aurora Coffee, you will immediately notice the full-width art on the walls. The menu at Aurora Coffee is seen below. Of course, there are traditional coffee/espresso options such as a cafe au lait and a cortado, but you can make things interesting by ordering something from the Bear Menu—roughly one-half iced coffee and one-half flavored milk. Brown bear is chocolate, Polar bear is peppermint plus white chocolate, and a Panda bear is a combination of white and black chocolate (makes sense). If you’re feeling bold, you can make it a Grizzly for a 3-times stronger kick! Hot and cold drinks available at Aurora Coffee. Coffee at Aurora. In the background: a full wall display of posters for local events, art shows, concerts, etc. Wide-angle interior view at Aurora Coffee. Another section of the artwork at Aurora Coffee. Twelve heads around a concentric circle, in perhaps some kind of meditative or meta-cognition state (subject to viewer interpretation). 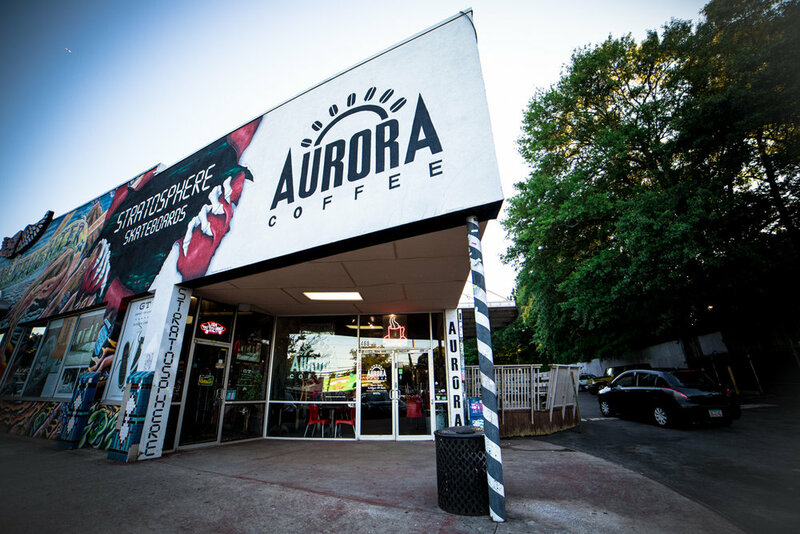 Here’s to hoping the weirdness and an embrace of the alternative endures, both at Aurora Coffee and at Little Five Points, a beloved neighborhood of Atlanta.